TOTO – the world’s largest toilet manufacturer from Japan developed a technology which reduces water usage by up to 35%. The technology uses air which is infused into the water coming out a shower head to reduce water consumption but still retain the same feeling on the skin as a conventional shower head. The TOTO air in shower is not a new technology – demonstrated in Japan a few years ago it started appearing in the west fairly recently. Earlier this year however the company introduced an interesting addition to some of the models called Air-in Click Shower. This new addition is a small bottom on the showerhead which when pressed stops the flow of water completely (think about this more like a pause bottom rather than an off switch), this is another water saving technology (a very simple one) which can reduce water consumption when you do not need water in the shower (for example while shampooing your hair). According to TOTO, the air in shower enable the “supreme water saving performance while maintaining the pleasant water touch”. Small air bubbles are mixed into each water drop which comes out of the shower using a mechanism which is built into the shower head. 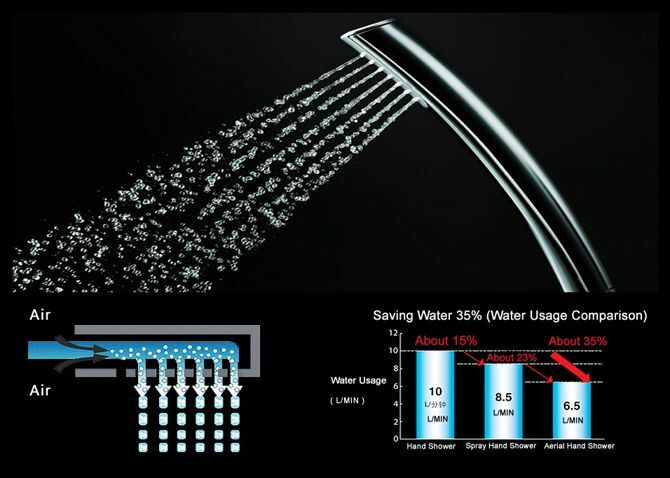 The users can enjoy sufficient water impulse and volume while saving as much as 35% of water compared to the conventional shower heads. According to TOTO the new Air in Shower technology can easily save a family of four about $180/year by reducing the amount of water used in every shower, depending on the water heating system used by each family, it can also cut CO2 emissions by up to 146 kg/year. Prices for the Air in Shower based showerhead start at around $70 – which if you take TOTO’s word will be returned to you in less than six months – depending on how much water you use in your shower. More information can be found on the TOTO website. Earlier this year we covered another innovative technology called the Dyson’s Airblade Tap a unique first of its kind faucet-dryer which makes the task of washing and drying your hands simpler and quicker than ever.